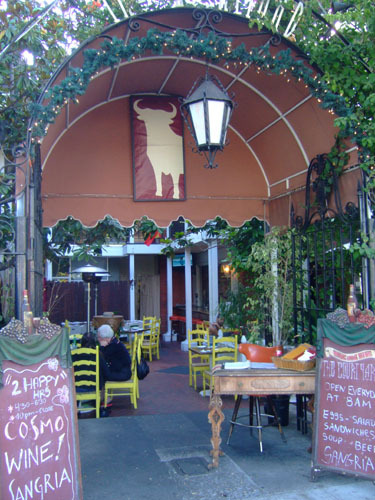 The Courtyard is a "Spanish Tapeo"-style restaurant located in the heart of West Hollywood, near Santa Monica and La Cienega. What brought us here was the going-away of a fellow classmate of ours. 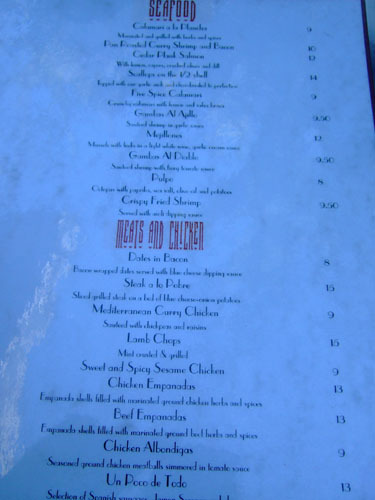 The mediocre reviews of the place on Yelp didn't exactly give me confidence, as I imagined the place was chosen more for being hip/fun/casual, rather than for the food. 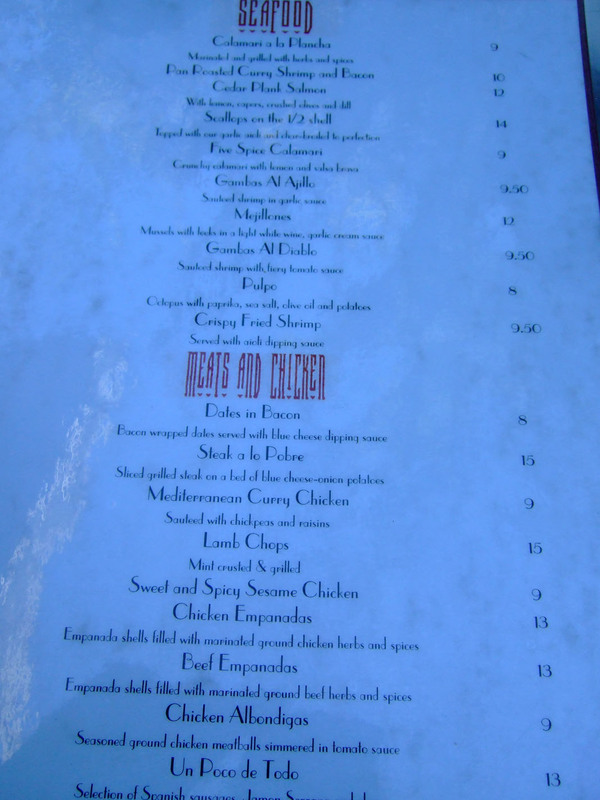 Nevertheless, I rarely get to have tapas, so that was enough to get me fairly interested. Coincidentally, we were here on my birthday, though this was not my birthday dinner. That meal is still yet to be determined. 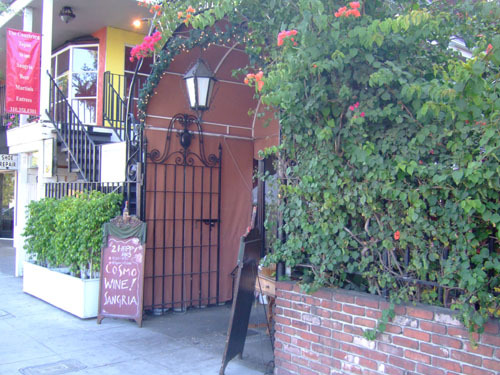 The word that comes to mind upon seeing the entrance is "quaint," a bit of a contrast compared to the bustling thoroughfare of Santa Monica Boulevard. The main dining room is really the area between two buildings. 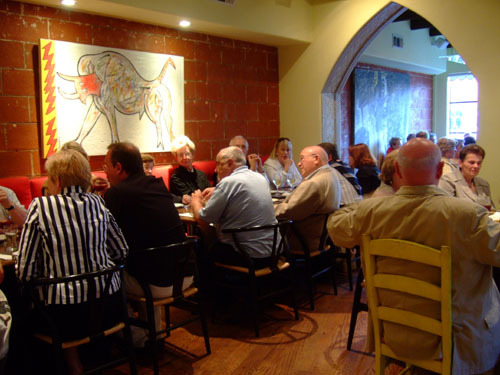 There is, however, plenty of indoor seating as well. But naturally, at a placed called "Courtyard," we opted to sit in the courtyard. The menu is comprised mostly of tapas-style dishes meant for sharing, though larger mains are available. Prices did seem a bit high for what was offered. Click for larger versions. 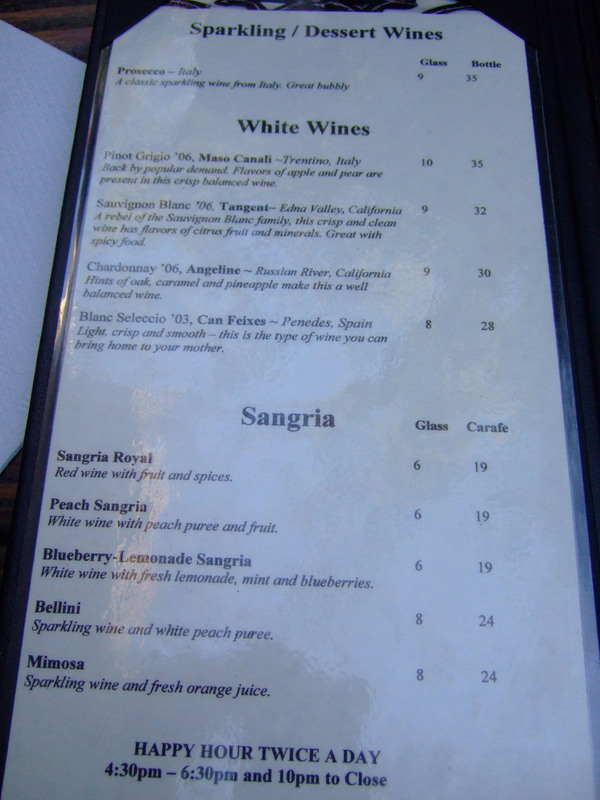 The wines by the glass list is limited, though reasonably priced. I wish we would've tried some of the the sangria though! Click for larger versions. 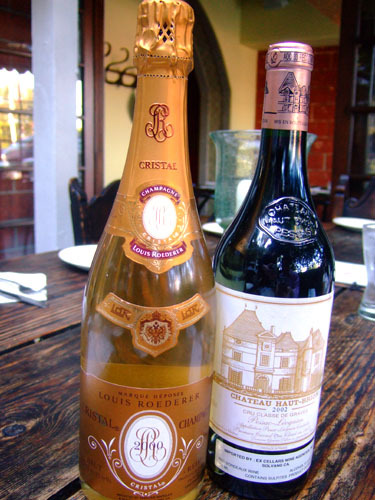 2000 Louis Roederer Champagne Cristal Brut - From my personal cellar, the 2000 Cristal is one of my favorite sparklers of all time. So smooth and robust, with lovely flavors of honey and citrus showing all the way through the finish. 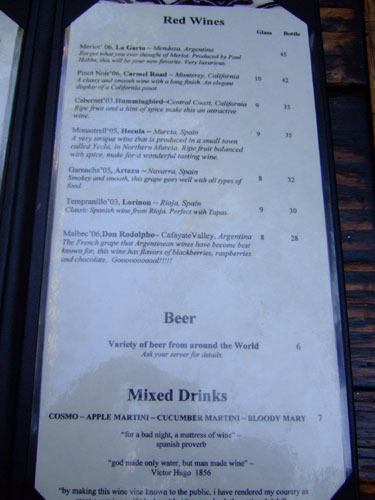 This is something even non-bubbly drinkers will love. 2002 Château Haut-Brion - From the Pessac-Léognan region in Bordeaux. The 2002 doesn't get the rave reviews of the vaunted 2000 and 2003 vintages, but I thought this wine was a pleasant surprise. Incredibly bold, with loads of dark berry and smoke, ending with a rich, lingering, silky finish. 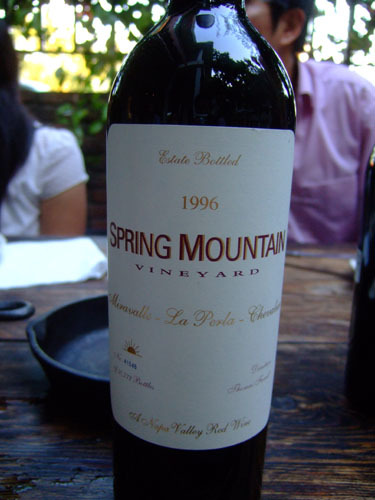 1996 Spring Mountain Vineyard Miravalle-La Perla-Chevalier - From Napa, a Bordeaux-style blend of 83% Cabernet Sauvignon, 10% Merlot, 5% Cabernet Franc, and 2% Petit Verdot. So different than the Haut-Brion above. The claret was much lighter, with much more peppery spiciness to it, but still soft, and with pronounced tannins for its age. 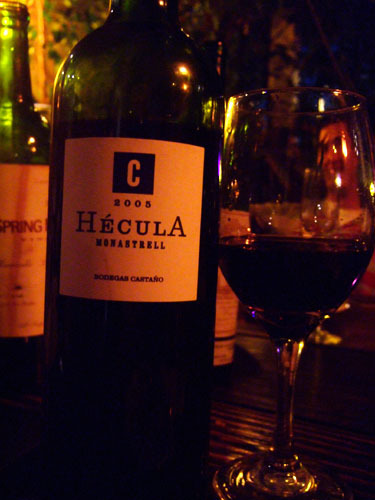 2005 Bodegas Castaño Monastrell Yecla Hécula [$35.00] - Finally, a Spanish wine. We first tasted this by the glass, and interestingly enough, I liked it better than when we decided to order the whole bottle. I imagine this was because the wine needed some time to breathe. 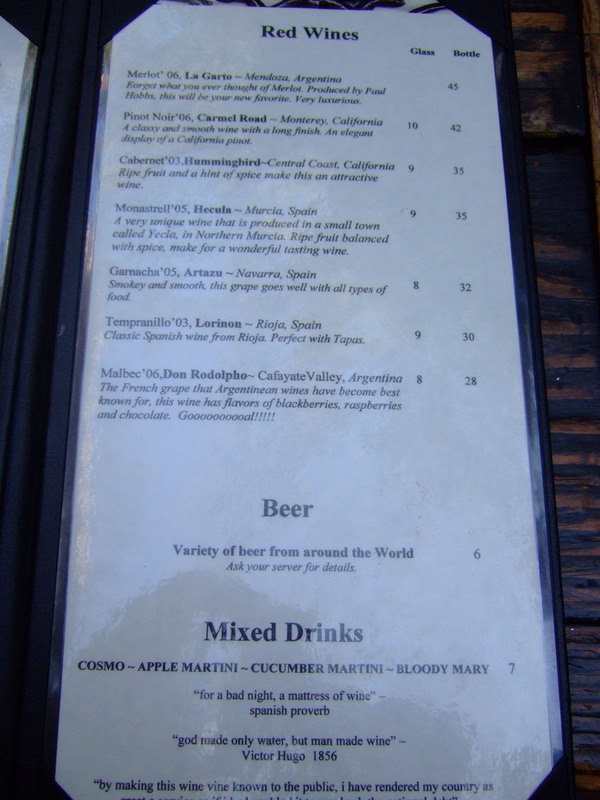 And indeed, given time, the spice and alcoholic kick gave way to softer earth, mineral, and blackberry flavors. 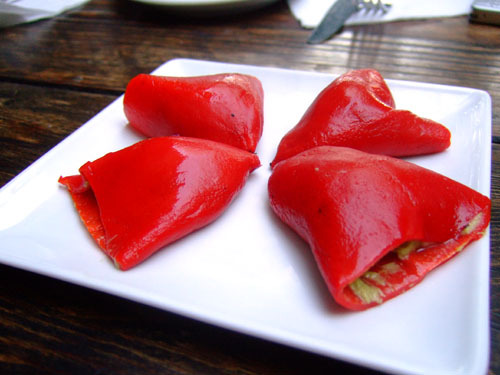 Sweet red peppers filled with sautéed vegetables and bleu cheese. 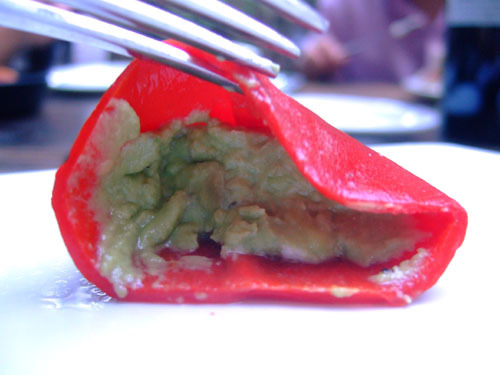 A bit limp, I would've liked to have seen more crispness in the peppers here, in order to better stand up to the cheese filling. Forgettable. 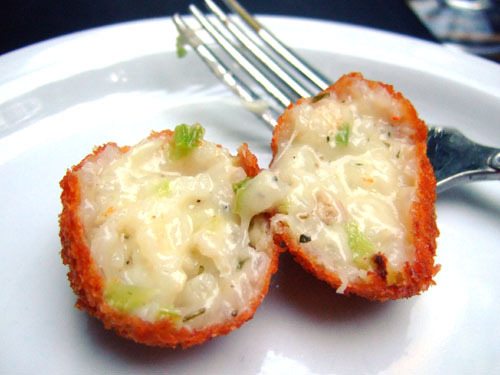 Given my recent penchant for risotto (which I discovered at Patina), I had to give these a try. They were actually quite tasty, and I appreciated the contrast between the creaminess of the interior (which could've been a good standalone risotto) and the crisp crust. 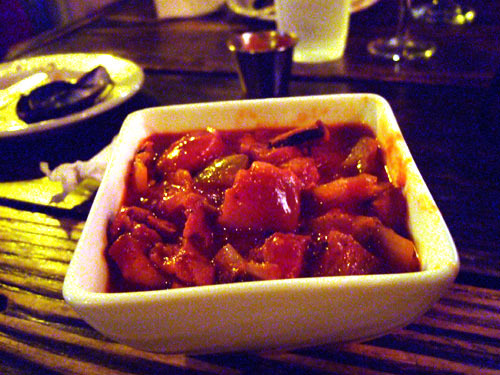 Sautéed shrimp with fiery tomato sauce. 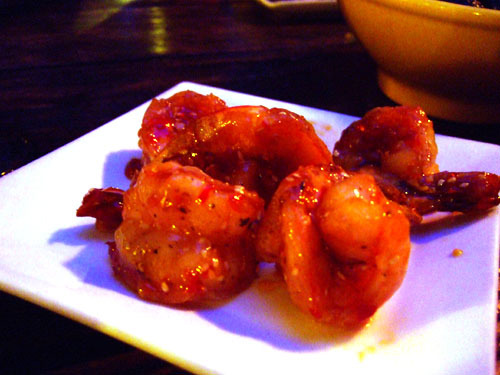 These were expertly cooked shrimp with a sauce that, while spicy, managed to enhance and not dominate the flavor of the shrimp. Nice, and arguably the best dish of the night. 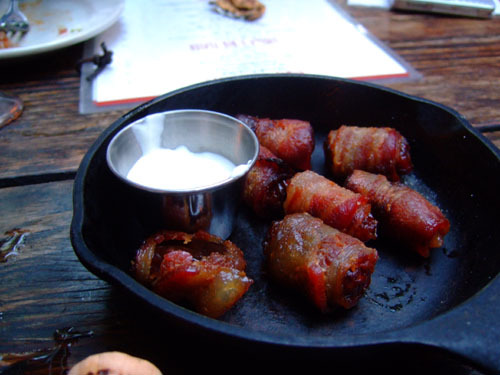 Bacon wrapped dates served with blue cheese dipping sauce. Unfortunately I don't think I was quick enough to try one of these, though others said they were quite good. 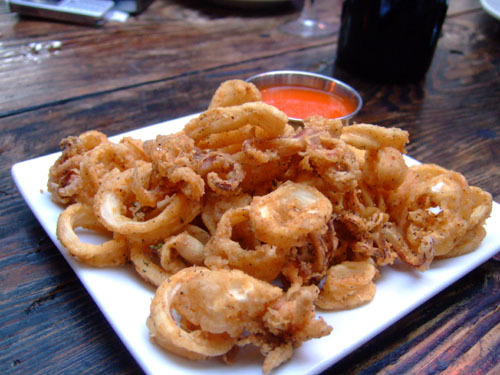 Crunchy calamari with lemon and salsa brava. 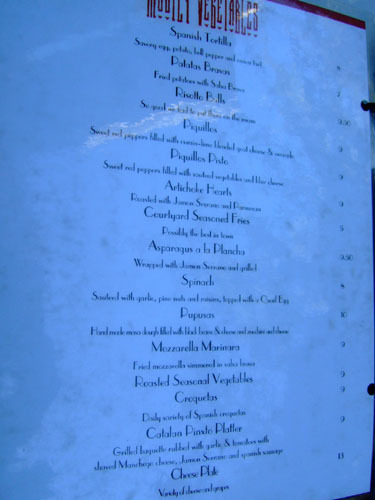 It seems like everyone and their mother makes some sort of fried calamari. I'm rarely disappointed, but I thought Courtyard's version was particularly good. Excellent on their own sans any sauces, it must be the "five spices" used. Very nice. 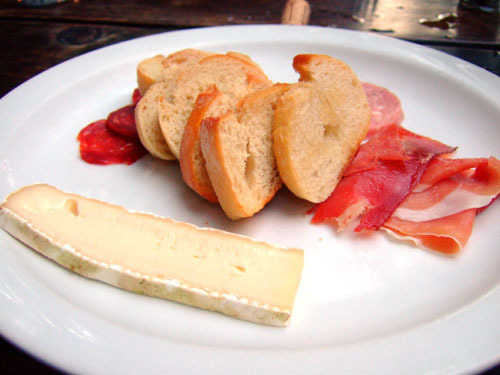 Selection of Spanish sausages, Jamon Serrano, and Manchego cheese. 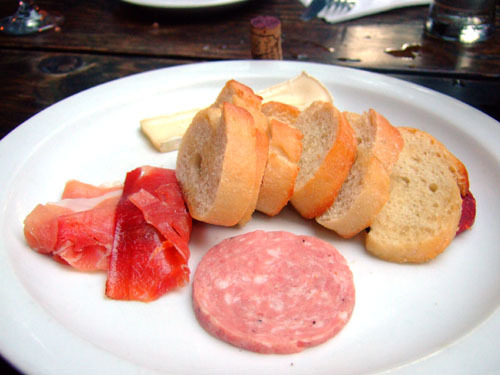 I wasn't impressed with the sausages, but I thought the thinly-sliced Jamon Serrano was very similar in flavor and texture to Italian prosciutto, which is a good thing. 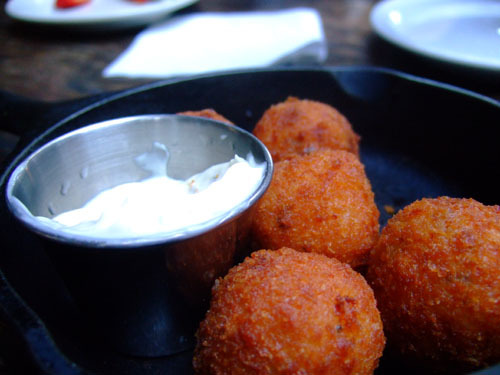 In addition, we had Manchego cheese, a semi-hard sheep's milk cheese made in the La Mancha region of Spain. 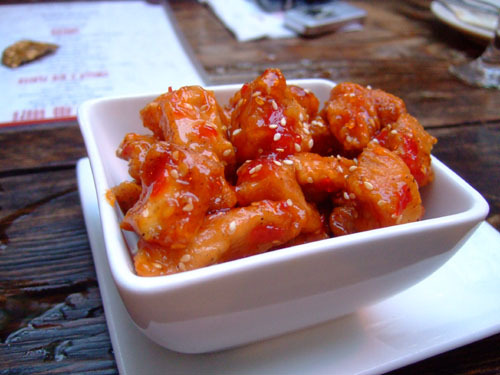 Its mild creaminess and subtle flavor made a good impression on me. 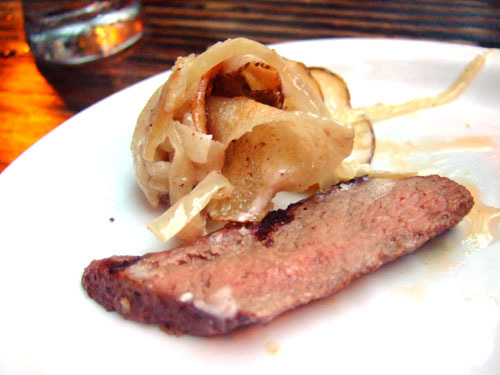 Sliced grilled steak on a bed of blue cheese-onion potatoes. Though the meat was cooked more than I prefer, this was still one of the best courses of the evening. 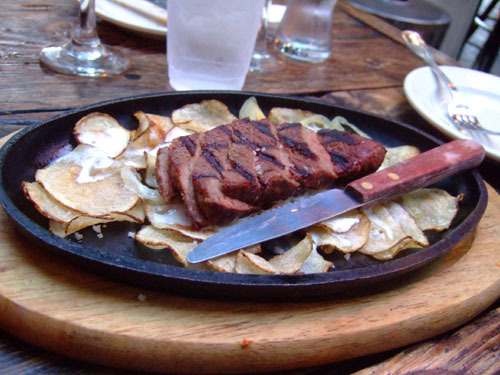 The steak was tender and surprisingly flavorful, and the addition of the cheesy potatoes further elevated the dish. This was pretty much identical to the orange chicken one can order at Americanized Chinese restaurants, so I'm not sure what it was doing on the menu here. I found it uninspired, though certainly not offensive (as opposed to, let's say, the octopus below). Handmade masa dough filled with black beans & cheese and zucchini & cheese. 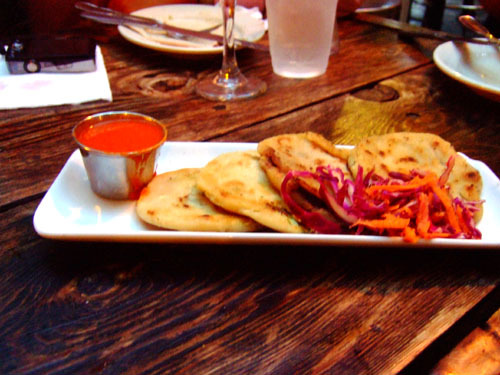 A pupusa is basically a thick tortilla stuffed with various items: cheese, beans, and zucchini in this case. This was my first time trying them, and although I found them tasty, they were a bit lacking in substance and impact. 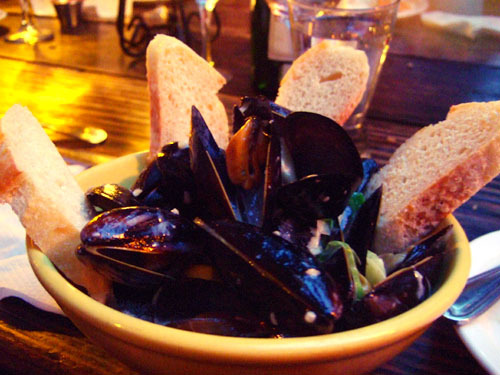 Mussels with leeks in a light white wine, garlic cream sauce. 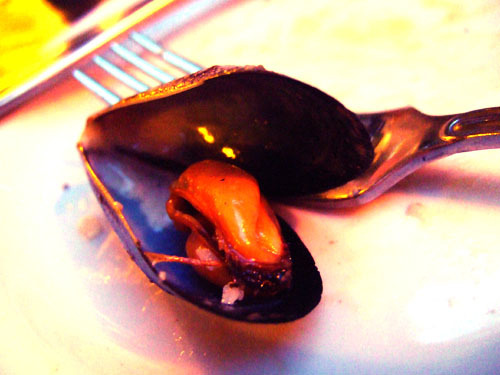 These were solid mussels, with a nice, light, fresh taste but maybe a bit lacking in the crisp texture that really good mussels have (see Summit). I did find the bread a bit superfluous. 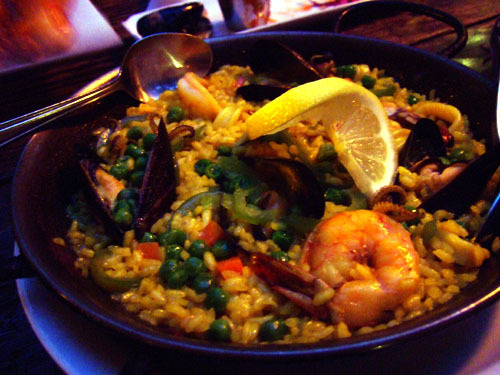 Saffron rice with sausage, chicken, fish, shrimp, calamari and mussels. This may very well be the first paella I've ever had. 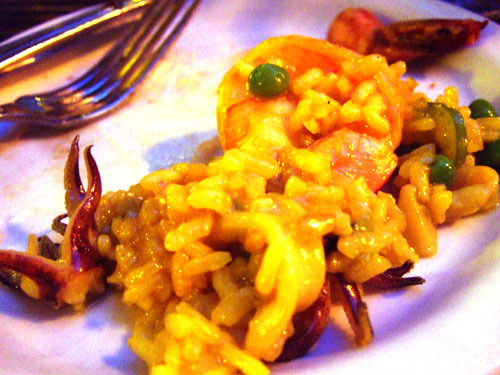 The saffron rice was fragrant on its own, and paired nicely with the various bits of meat and seafood, especially the sausage and calamari. I definitely liked the addition of peas into this medley of flavors as well. 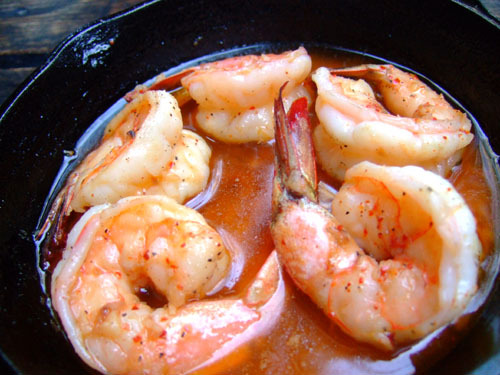 Sautéed shrimp in garlic sauce. This was one of the stronger dishes of the night I thought. Garlic and shrimp is almost always a winning combination, and it didn't let me down here. 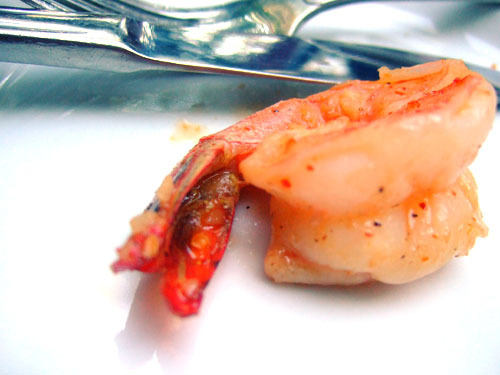 The shrimp were well-cooked and the sauce didn't overpower. Not quite as good as the Gambas Al Diablo above though. 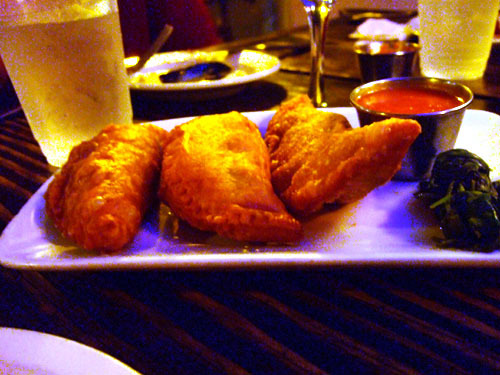 Empanada shells filled with marinated ground beef herbs and spices. 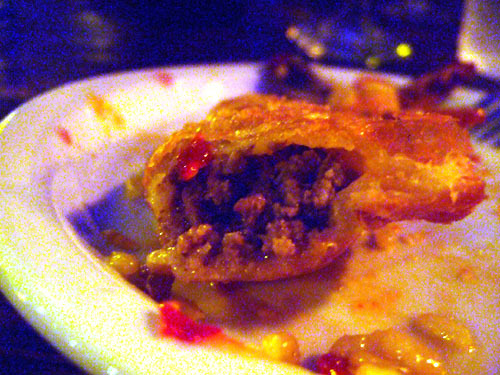 Though the ground beef didn't seem to be of particularly high quality (think Taco Bell), the empanadas were fairly tasty, albeit a bit nondescript. Serviceable. Octopus with paprika, sea salt, olive oil and potatoes. This was easily the most disappointing dish of the night for me. As the photo might suggest, the flavors here were extremely muddled and the octopus really lost any semblance of its unique character. Quite a mess actually. 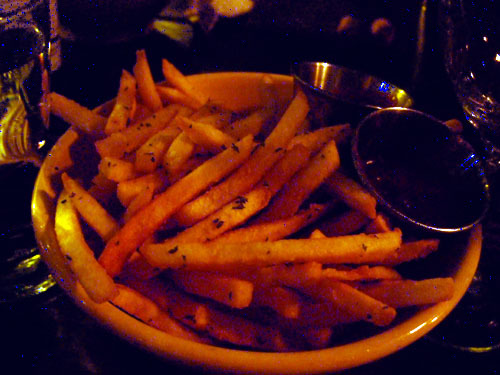 The menu advertises these fries as "possibly the best in town." I doubt that. They were tasty, but really nothing special. McDonald's' are at least comparable in my opinion. 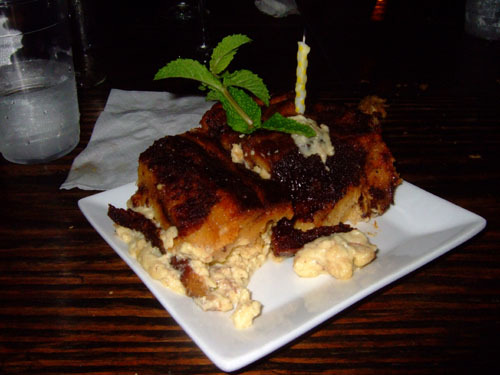 Since it happened to be my birthday, we ended the meal with a complementary serving of this Nutella bread pudding. Nutella is, of course, the ubiquitous hazel-nut based spread. 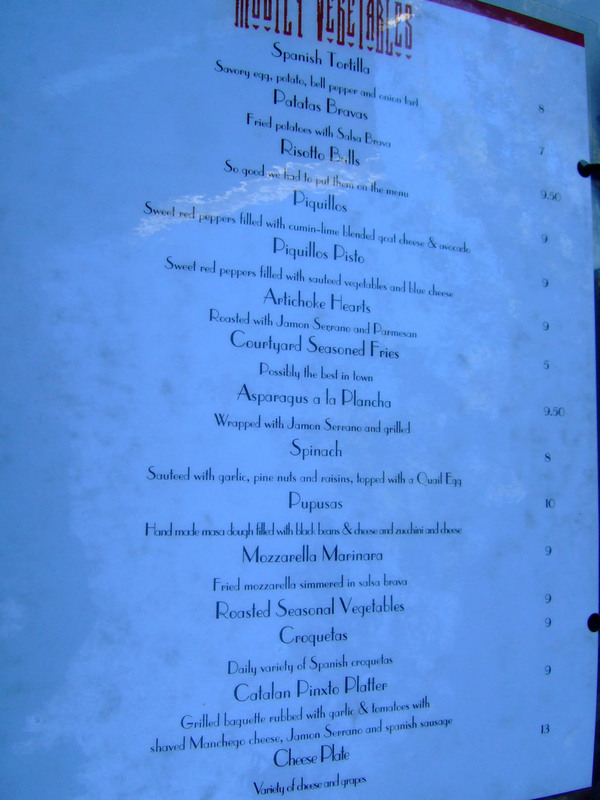 But unfortunately, I didn't really get much of its flavor here, though the bread pudding itself was fairly solid. Not bad for free, though perhaps I would've been disappointed had I had to pay for it. In the end, I did have a good time here, but that was due to the company, not the cuisine. 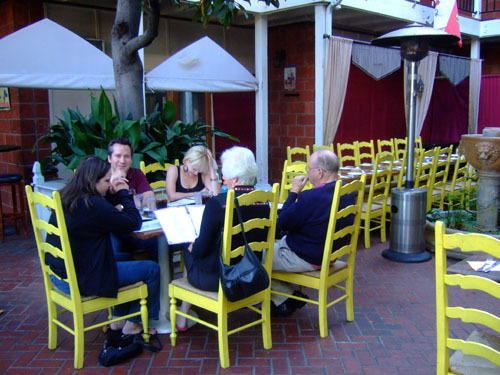 The Courtyard is a fun place, and I think it's great for large groups that seek a unique, informal vibe. 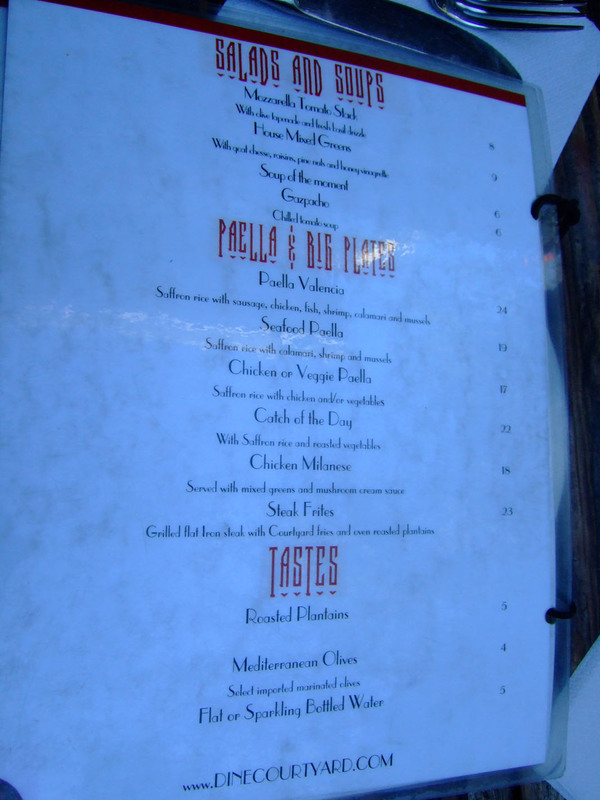 So come for the ambiance, stay for the food if you must.